Wouldn’t it be nice if you could avoid heater repairs? Unfortunately, this just isn’t possible. And as winter comes to a close and our temperatures start warming, now is no time to neglect any heating repair needs you may have. Let’s face it, eventually you’ll encounter problems with your heating system. The best thing you can do is learn to recognize when something is amiss with your furnace or heat pump so you can get ahead of them. Hopefully, you had maintenance done before the heating season began, and you took care of any impending repair needs at that time. But whether you skipped a tune-up this year or forgot to schedule recommended repairs, something led you to read this blog post! If you suspect you may need furnace repairs of some kind, keep reading for an overview of the signs to watch for that something is, in fact, wrong with your heater. Some furnace repair symptoms are subtle—so much so that you may not even notice them. A heater that is blowing cold air out of its vents, however, is having issues. It could be something like a fuel combustion problem, or maybe a leak in the air ducts leading to a certain part of your home. Whatever the case may be, you need to have your system repaired so you can ensure your comfort before fall comes back around. There’s something a bit tricky about heating problems—and that is sometimes, you won’t really notice a drop off in the system’s heating output. So, it’s important to keep an eye on how much you’re paying to heat your home. Of course, the colder it is the more you’re going to use your furnace, and therefore the higher your costs will be. But if they’re much higher than what you paid last year, or higher than your neighbor’s energy bills, despite comparable use, then you may be looking at a furnace struggling to operate as efficiently as it once did. This is actually somewhat normal when you run your heater for the first time at the beginning of winter or in the fall. Dust settles on the coils and the vent openings, so when you turn the furnace on for the first time, that all has to burn off. However, if you continually smell burning coming from your heater, or if you just started smelling it this close to the end of the season, then something is wrong with your furnace that could not only threaten your comfort, but your safety too. 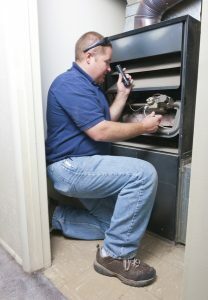 Does it seem like your furnace is running erratically—starting up, running briefly, then cycling back down? This is called short-cycling. While it may be due to something simple, like a clogged air filter (make sure you’re changing yours every 1–3 months), it could be something more serious. Check if changing the air filter works, and then if not, be sure to give our team a call! When you need reliable heater repair in Albuquerque, NM, look no further than Roadrunner Air Conditioning, Heating & Refrigeration. Contact us today!